I have discussed a lot of these novel methods of using the cards in various blog posts, but I thought I would collect links to the best of them here along with some links to similar posts on other websites. I have also included some comments about these techniques to get you started. On one of my posts from a few years ago, I talked about how a reader of my blog suggested a way to do a paired (or group) reading, one card at a time, and I responded with a similar technique in which the querent and the Tarot reader engage in a dialogue that is facilitated by an occasional draw of a new card. Mary Greer presents an interesting variation on the conversational mode of using the cards in a post on her blog which discusses the first tarot spread to appear in print. On an article on my blog I have described quite a few games you can play with the cards, and I don’t mean something like Bridge. (There are, however, several card game that use Tarot cards.) These games do things like bring out the players’ creativity, reveal their inner thoughts and feelings about each other, initiate philosophical discussions, and deepen their understanding of the cards in a fun way. My personal favorite is Tarot Rummy, which is a great way for a small group of people to use the cards for getting acquainted or strengthening their interpersonal relationships. I have also presented a couple of scripts for guided visualizations, one with the Fool card (via a YouTube video where I read the script to you) and another with the High Priestess (where the script is written out for you). And I have shown how you can use a guided visualization to help you cope with the death of a loved one. 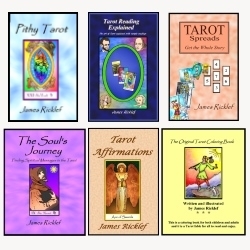 I have written an entire book (called, appropriately enough, Tarot Affirmations) on the use of Tarot cards to suggest affirmations and to empower those affirmations with the evocative images on the cards. The affirmations presented in this book can help you in your journeys of self-improvement, self-empowerment, and self-enlightenment. For more about what affirmations are and how they are related to Tarot cards, read my blog post on Tarot affirmations from a few years ago. We generally consider Tarot cards to be a vehicle for finding answers, but questions can be as valuable as answers because they make us think. Thus, they can lead us to explore the answers lurking within our own unconscious mind. Profound questions can also stimulate deep, philosophical discussions with other people, which can be a nice change of pace. So using the cards this way, you can come up with some very interesting topics of conversation. In one blog post, I describe this process further, and I present some examples of thought-provoking questions that the cards may suggest. So there you have it — experiment, explore, and have fun with the cards, and find your own ways to use them too! They aren’t just for doing readings, you know.